Holmes, I cried. "Is it really you? Can it indeed be that you are alive? Is it possible that you succeeded in climbing out of that awful abyss?" Sherlock Holmes did not lose his life at the Reichenbach Falls. Nor has three years of absence taken away his power to startle the faithful Dr. Watson. But it is the Park Lane mystery—-the murder of the Honorable Ronald Adair—-that brings Holmes back to life and the search for the second most dangerous man in London. And when that case is satisfactorily concluded, Holmes is once again free to devote himself to examining twelve more of those interesting little problems that the complex life of London so plentifully presents. 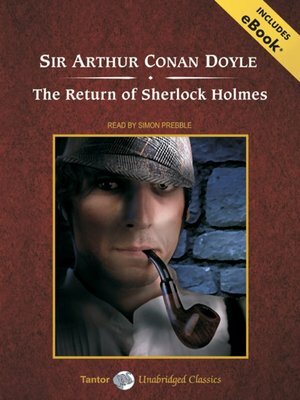 The Return of Sherlock Holmes contains the following tales: "The Adventure of the Empty House," "The Adventure of the Norwood Builder," "The Adventure of the Dancing Men," "The Adventure of the Solitary Cyclist," "The Adventure of the Priory School," "The Adventure of Black Peter," "The Adventure of Charles Augustus Milverton," "The Adventure of the Six Napoleons," "The Adventure of the Three Students," "The Adventure of the Golden Pince-Nez," "The Adventure of the Missing Three-Quarter," "The Adventure of the Abbey Grange," and "The Adventure of the Second Stain."